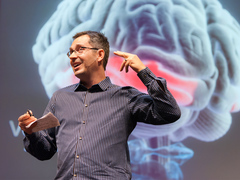 Tom Wujec: 3 ways the brain creates meaning Tom Wujec, who’s given three TED Talks, introduces us to a deceptively simple exercise to help people solve problems and synthesize ideas: drawing how to make toast — without words. This reveals much about the drawer — some focus on the toast, some on the toaster, some on the person making it and some on the supply chain. All express nodes and links, revealing a systems model that maps how we think things work. The exercise can be expanded: drawing each step on cards or sticky notes allows movement of nodes and a more rapid way to express, reflect, and analyze. When a group of people draw collaboratively — tackling any subject from company vision to long-term sustainability — what starts out as a mess of ideas is refined until a pattern emerges that integrates everyone’s point of view. TED Fellow Xavier Vilalta uses architecture to connect people with nature, and to bring out the spirit of local cultures. When asked to build a big, shiny, glass-walled shopping mall in Ethiopia — one that would be difficult to cool and that would be empty because few in the area could afford the shops — Vilalta drew inspiration from nearby outdoor markets and from the geometric patterns he saw on Ethiopian women’s dresses to create a new kind of mall. Francesca and Roberto D’Angelo’s son, Mario, was born in January 2011. Ten days later, he had a stroke that paralyzed one side of his body. The two wondered: Would he ever walk? Would he be normal? Had they failed as parents? Soon, however, they realized that Mario was looking at them and mirroring their actions — and thus they couldn’t continue to look at Mario’s disability as a problem. They share how they flipped the script and made this challenge into an opportunity, with wonderful results. Jane McGonigal: The game that can give you 10 extra years of life Game designer Jane McGonigal shares her favourite game: massively multiplayer thumb wrestling. It’s the only game in the world that allows the player ten positive emotions in 60 seconds or less — joy, relief, love, surprise, pride, curiosity, excitement, awe & wonder, contentment and creativity. She demonstrates with three audience members — simply put three thumbs together, four, add any free thumbs — then encourages the whole audience to stand and form interconnected nodes, with not a single thumb idle. Bastian Schaefer from Airbus is revisioning the future of air travel. Working with a team developing a more sustainable aircraft, he unveils a model plane that appears to be made of an elaborate latticework skeleton, something he calls a “bony structure.” His design vision incorporates an aircraft fashioned from 3D-printed carbon nanotubes creating structures that allow infrastructure to transmit data and electricity. These more lightweight materials would reduce weight, key to making aircraft more sustainable. Seats would mold themselves to the shape of individual passengers, community areas would allow passengers to stand and play a round of golf, and best of all, there’d be no tiny airplane windows — a transparent shell enclosing the skeletal structure would allow in natural light by day and a view of the stars at night. 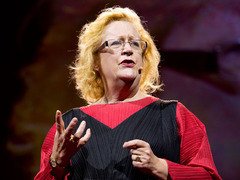 Margaret Heffernan: Dare to disagree Margaret Heffernan defines silence as the “cavernous sound of things not being said.” She cites a disturbing stastic: that 75% of executives have concerns that don’t they voice, either out of fear of recrimination or a feeling that saying something wouldn’t change anything. She inspires us to speak up, sharing how simple questions can not only lead to new products and innovations, but can avert disaster and avoid harm. üniversite öğrencisi masözler kendi evinde masaj keyfi yapıyor. evde masaj ankara için en iyi profesyonel masaj yapmak ayrı bir sanattır diyor.